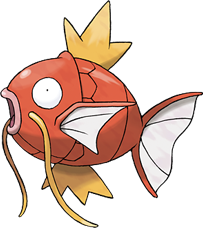 Magikarp, known in Japan as Koiking (コイキング, Koikingu) is a Pokémon species in Nintendo and Game Freak's Pokémon franchise. Created by Ken Sugimori, Magikarp first appeared in the video games Pokémon Red and Blue and subsequent sequels. They have later appeared in various merchandise, spinoff titles and animated and printed adaptations of the franchise. Known as the Fish Pokémon, Magikarp is found in many bodies of water, especially lakes, rivers, and ponds. Magikarp is a red-orange, medium-sized fish. Its notable characteristics include large, heavy scales. Its fins are primarily white, but it has a stiff, three-pointed fin on its back and, a four-pointed fin on its stomach which are both yellow. The shape of the dorsal fin resembles a crown, leading to its Japanese name Koiking. It also has long barbels, which are white on females and tan on males. Although this Pokémon is capable of surviving in even the most polluted ponds, it is usually overlooked by trainers because it is pathetically weak. Even in the heat of battle it will do nothing but flop around. They are normally seen using Splash, which is unusual, as it makes them easy targets to predators. Before the species multiplied, it is believed that the ancestors of Magikarp were actually much stronger than the Magikarp seen today, and this belief has led scientists to research this species. Long-lived Magikarp are able to utilize their immense splashing power to leap high enough to jump mountains. Magikarp is found in many bodies of water, such as lakes, rivers, and ponds. It is not a strong swimmer, and currents in the water will sweep it downstream. The concept of Magikarp evolving into Gyarados is loosely based on the Chinese mythological tale of the Carps leaping over the Dragon Gate. According to the legend, carps that leap over a legendary waterfall, referred to as the Dragon Gate, are transformed into dragons. Magikarp has drawn comparisons to Feebas; however, the latter is usually regarded higher in the gaming community because it can learn far more moves than Magikarp in the Pokémon games. In the video game series, Magikarp is seen commonly when fishing with an Old or Good Rod. In Pokémon Red and Blue, and their remakes, an NPC will sell the player a Magikarp. A similar character appears in Pokémon Black and White. In Pokémon Diamond and Pearl, Magikarp appear flopping around in a dried up lake. Outside of the main series, in Pokémon Stadium, Magikarp featured in its own mini game called "Magikarp Splash", in which players must Splash high enough to hit the button at the top of the screen as many times as it can. A mobile video game, called Pokémon: Magikarp Jump, was announced in February 2017 under the title Splash! Magikarp, and was released for Android and iOS on 25 May 2017. In the anime, Magikarp has appeared several times, most notably as the subject of a running gag in which a salesman attempts to trick Team Rocket into buying Magikarp in various guises, the first one being in Battle Aboard the St. Anne. In The Joy of Pokémon, a Nurse Joy from the Orange Islands befriended a giant Magikarp that saved her as a child. It evolved into an equally large Gyarados, but it remained friendly. In The Wacky Watcher, Ash, Misty and Tracey help a Pokémon Watcher named Dr. Quackenpoker observe the migration and evolution of a school of Magikarp. Another, in Ya See We Want an Evolution, was nicknamed the strongest Magikarp. This Magikarp was unique in that it was in fact able to battle very well, even knocking out Pikachu. A Magikarp shaped stuffed pancake served in a restaurant in Japan. GamesRadar described it as "[t]he ultimate in useless Pokémon", though noted its evolution Gyarados as one of the "biggest" characters in the series. IGN called it "possibly the most docile, unassuming, and weak of all the monsters in the Pokémon world" and further described it as serving "solely as comic relief", until its evolution into Gyarados. IGN criticized Magikarp as the "worst Pokémon ever", citing its low statistics and inability to learn moves from Technical or Hidden Machines, calling it a "Water wussymon." An IGN guide jokingly noted a trainer in Pokémon Platinum as having the "best team among those in the area" due to having six Magikarps, five of which are unable to attack. The book Gaming Cultures and Place in Asia-Pacific cited it as an "example of a common recurring and weak element" in the games, whose presence rather than function was to "emphasize the exclusivity and strength of other, rarer creatures for players to find". Loredana Lipperini, author of the book Generazione Pokémon: i bambini e l'invasione planetaria dei nuovi, described it as "innocuous-looking." Kotaku's Stephen Totilo also gave criticism to Magikarp, commenting that the using it as his character in Pokémon Rumble made him learn the "hard way" that he "couldn't have had a worse idea." The Australian Broadcasting Corporation's Good Game praised PokéPark Wii: Pikachu's Adventure for its faithfulness to various Pokémon's abilities; while Torterra and Hitmontop were described as using Razor Leaf and Rapid Spin, they merely described Magikarp's actions as just "being Magikarp." The web site Bright Side of the Sun used an analogy involving Magikarp, commenting that the words "defense" and "rebounding" were "tossed around" more by their coach to them than "a Magikarp card at a Pokémon convention in 1997." ^ Game Freak (2003-03-17). Pokémon Sapphire. Game Boy Advance. Nintendo. Magikarp is virtually useless in battle as it can only splash around. As a result, it is considered to be weak. However, it is actually a very hardy Pokémon that can survive in any body of water no matter how polluted it is. ^ Game Freak (2007-04-22). Pokémon Diamond. Nintendo DS. Nintendo. It is said to be the world's weakest Pokémon. No one knows why it has managed to survive. ^ Game Freak (2000-10-15). Pokémon Silver. Game Boy Color. Nintendo. For no reason, it jumps and splashes about, making it easy for predators like Pidgeotto to catch it mid-jump. ^ Game Freak (1998-09-30). Pokémon Red. Game Boy. Nintendo. In the distant past, it was somewhat stronger than the horribly weak descendants that exist today. ^ Game Freak (2003-03-17). Pokémon Ruby. Game Boy Advance. Nintendo. Magikarp is a pathetic excuse for a Pokémon that is only capable of flopping and splashing. This behavior prompted scientists to undertake research into it. ^ Game Freak (2009-03-22). Pokémon Platinum. Nintendo DS. Nintendo. A Magikarp living for many years can leap a mountain using Splash. The move remains useless, though. ^ Game Freak (1999-10-19). Pokémon Yellow. Game Boy. Nintendo. Famous for being very unreliable. It can be found swimming in seas, lakes, rivers and shallow puddles. ^ Game Freak (2001-07-29). Pokémon Crystal. Game Boy Color. Nintendo. This Pokémon gets easily pushed along rivers when there are strong currents. It is very hard to evolve. ^ Funnell, Rob. "'Splash! Magikarp', a Bizarre New Pokemon Title, Has Been Announced for the App Store". TouchArcade. Archived from the original on 18 February 2017. Retrieved 19 February 2017. ^ "A New Pokemon Game Is Out Now For Mobile". Archived from the original on 2017-10-06. ^ Yukiyoshi Ōhashi (writer) (September 28, 1998). "Battle Aboard the St. Anne". Pokémon. Season Indigo League. Episode 15. Various. ^ Junki Takegami (writer) (March 4, 2000). "The Joy of Pokémon". Pokémon. Season Adventures on the Orange Islands. Episode 92. Various. ^ Shinzō Fujita (writer) (September 16, 2000). "The Wacky Watcher!". Pokémon. Season Adventures on the Orange Islands. Episode 109. Various. ^ Yukiyoshi Ōhashi (writer) (July 10, 2007). "Ya See We Want an Evolution!". Pokémon. Season Diamond and Pearl. Episode 21. Various. ^ Elston, Brett. "The complete Pokemon RBY Pokedex, part 12". GamesRadar. Future Publishing. p. 9. Archived from the original on 2014-03-06. Retrieved 2009-10-03. ^ "Gyarados Biography". IGN. IGN Entertainment. Archived from the original on 2013-05-25. Retrieved 2009-10-03. ^ pokemonofthedaychick (October 21, 2002). "Pokemon Crystal Version Pok¿mon of the Day: Magikarp (#129) - IGN FAQs". IGN. Archived from the original on February 5, 2009. Retrieved 2009-10-14. ^ "Video Games, Wikis, Cheats, Walkthroughs, Reviews, News & Videos - IGN". IGN. Archived from the original on 2010-10-23. ^ "Pokemon Platinum Guide & Walkthrough - Nintendo DS - IGN". Archived from the original on 2011-07-21. ^ Hjorth, Larissa; David Surman (2009). "9". Gaming Cultures and Place in Asia-Pacific (PDF). Taylor and Francis. ISBN 0-415-99627-9. Archived from the original (PDF) on 2010-06-20. Retrieved 2009-06-06. ^ Lipperini, Loredana (26 May 2017). "Generazione Pokémon: i bambini e l'invasione planetaria dei nuovi "giocattoli di ruolo"". Castelvecchi. Archived from the original on 29 June 2011 – via Google Books. ^ Totilo, Stephen. "At Last, An Easy Pokemon Game". Archived from the original on 2010-01-06. ^ "Good Game Spawn Point - PokePark Wii: Pikachu's Adventure". www.abc.net.au. Archived from the original on 2011-09-22. ^ "Phoenix Suns Look To Continue Defensive Magic Against John Wall, Washington Wizards". Bright Side Of The Sun. 5 December 2010. Archived from the original on 8 December 2010. "Magikarp: The most useless-seeming monster in the Pokeverse hides an awesome secret". Edge (249): 122–123. Jan 2013. This page was last edited on 18 April 2019, at 17:18 (UTC).